DxOmark, the leading independent lab for testing camera and lens image quality, has declared the new Sigma 85mm f1.4 Art lens the ultimate lens to date, outperforming competitors from Nikon, Canon, and Zeiss. World champion (heavyweight division); the Sigma 85mm f1.4 Art lens. The 85mm lens has an overall score of 51, the highest score in the database, followed by the Zeiss Distagon Otus 1.4/55, Zeiss Planar Otus 85mm f14, and the Sony FE 85mm f1.4. 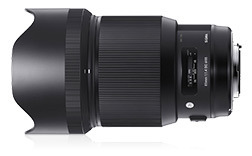 Sigma’s latest 85mm lens is bulkier than its predecessor, the EX model released way back in 2010, and is the most expensive of the Art lens range with an RRP of $1699. DxOmark notes this price is around 25 percent higher than earlier models, but still considerably cheaper than equivalent ‘similar audience’ lenses from competitors. It was compared primarily with the AF-S Nikkor 85mm f1.4G, and the Zeiss Milvus 1.4/85mm. ‘While you might think the US$1199 is a lot for the Sigma, there’s a US$1000 premium for the Nikon glass, a well-known and highly-regarded model that performs well in our tests. We’ve also included the manual-focus-only Zeiss Milvus in our comparison, as it’s aimed at a similar audience. At around US$1800, it’s a more realistic option than the US$4500 Otus equivalent,’ said DxOmark. ‘In our tests, both the Nikkor and the Milvus are sharp wide-open, and continue to improve in sharpness across the field when stopped down. However, the Sigma has the best symmetry of the three, and the Nikon the worst (which never appreciably improves till f8 and above). DxOmark doesn’t test AF speed, but it’s ‘encouraged’ that the heavier lens has been given a new sonic-type HSM autofocus motor with 1.3x the torque of its predecessor. The review concludes that Sigma has designed one of the best-performing full-frame 85mm lenses tested so far. And looking at the top-ranked lenses, Nikon and Canon are hardly in the picture. The first lens from either comes in at 18th ranking, the Nikkor 85mm f1.4; and Canon makes its first appearance at 26 with its EF 35mm f1.4L II USM. The best performing lenses, according to DxOmark, are designed by Zeiss, Sony, Sigma and Tamron – with Zeiss dominating. ‘Until only recently, Canon and Nikon were on safe ground with their high-speed primes, but makers such as Sigma and Tamron (and Zeiss) are beginning to make inroads. While all the full-frame Art series lenses are excellent performers optically, the latest model in the range is also its best,’ it concludes.